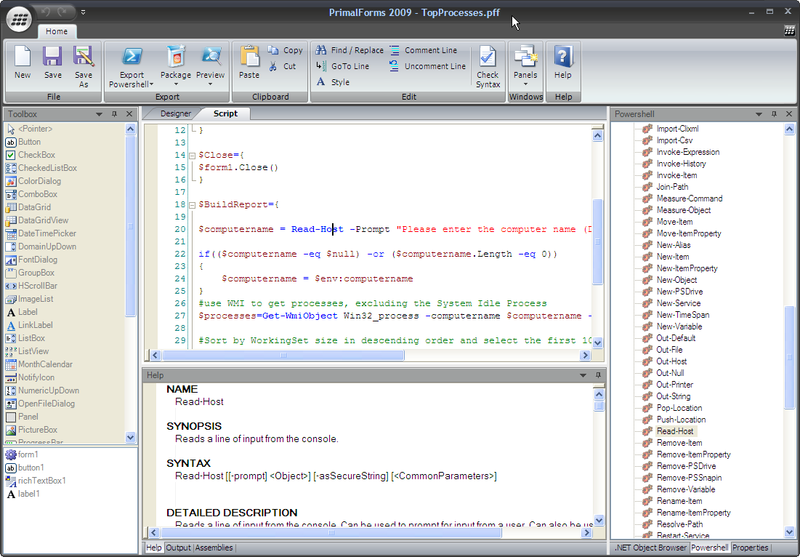 PrimalForms 2009 features integrated help to assist users with their form scripting. This blog covers some of its features. PrimalForms allows users to access help on any panel or window simply by pressing the F1 key. Depending on the active window, help will take the user to the corresponding Help topic. For example, if a user would like more information on the Assemblies Panel, the user simply have to click on the Assemblies Panel and press the F1 key. The Help document will then open and display the “Assemblies Panel” topic. This help applies to all windows in the application. In addition to application help topics, the Help Documentation features a “Getting Started” Section which is designed to instruct new users on how to create their very first form. The guide also covers some basic controls and how to incorporate them in your forms. The F1 key plays an additional role in the Script Editor. The F1 key can provide the user with information on cmdlets and variable types, depending on the position of the caret in the editor. For example, if the user clicks on a cmdlet name in the script and presses the F1 key, the help documentation for the cmdlet will be displayed in the Help Panel and highlighted in the PowerShell Panel. Cmdlet help information is also automatically displayed when the user types the space character after the cmdlet name. 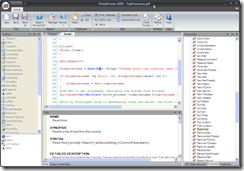 TIP: Just like the script editor, the Help Panel features a split view display to allow users to view two separate sections of the cmdlet help at the same time. Additional help information is displayed when a user hovers the cursor over a cmdlet or variable. 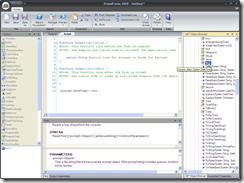 Not only does the F1 display the cmdlet help, but users can use the F1 key to find the type information for variables, properties, and methods in the .Net Object Browser. TIP: Pressing the F1 key on variables selected in the script editor, automatically selects the corresponding type in the .NET Object Browser, thus saving the users from having to manually search the browser. For example, pressing the F1 key on the $form variable, results in the selection of System.Windows.Forms.Form object in the .NET Object Browser. 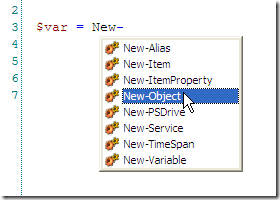 The .NET Object Browse is used to display all the objects contained in the .NET assemblies. The objects are grouped by assembly and namespace. 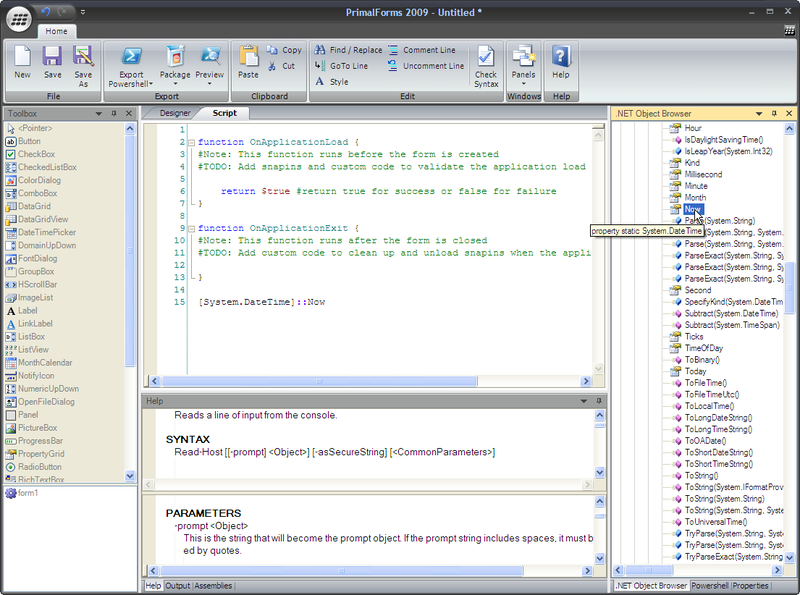 It allows users to view all the properties and methods of particular objects / controls, including their static members. Static members are properties or methods that are shared by an object type and are not instantiated with the object. In other words, it does not depends on an object (variable) to be created, in order to access these members. In PowerShell, accessing a static member is differentiated from accessing a variable member. As you can see, users must specify the class name in brackets and use the “::” operator to access a static member. Users familiar with C#, will notice that PowerShell deviates from what they would expect to see in C#. 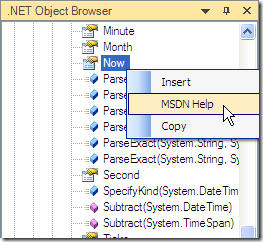 TIP: If a user is unsure about a property or method, they can right click on the questionable object in the .NET Object Browser and select the “MSDN Help” menu option. This option will take the user to the Online MSDN Help Documentation, which provides type descriptions and samples. 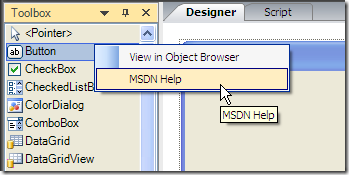 TIP: Users can also access the MSDN Help directly from the Toolbox Panel while working in the Designer tab. Majority of the help is integrated directly into PrimalForms’ PrimalSense. 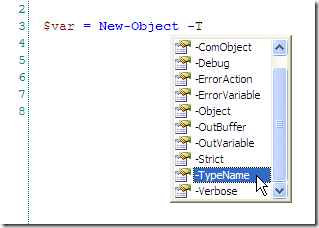 For example, PrimalSense will list properties and methods of objects after users type the ‘.’ operator. Further more the PrimalSense will list all available variables, including all the form objects when typing the ‘$’ character. TIP: Use the Assembly Panel to expand PrimalSense’s type support. Added assemblies will automatically be added to the .NET Object Browser. In addition, PrimalSense helps facilitate scripting by listing available cmdlets that match the verb the user is typing. PrimalSense also assists users by displaying the parameters of a cmdlet. Furthermore, snapins added in the script are automatically integrated into PrimalForms’ PrimalSense and the PowerShell Panel. Hopefully with this blog, users have a better understanding of how to use PrimalForms 2009’s integrated help to assist in their scripting.